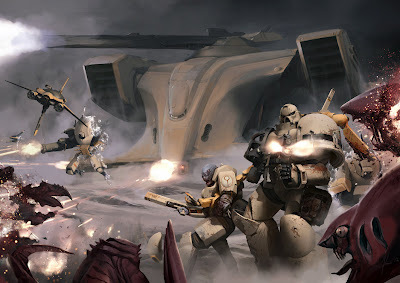 Warhammer Tau: New Tau Rumours - Now for a little reality check! New Tau Rumours - Now for a little reality check! Are These Real? Krootox Giant Rumors and Firewarriors BS4? This email came in yesterday regarding the rumors of a Giant Krootox Giant and Firewarriors moving up in the world to BS4. I want to say that this bit comes from a very much in the know source, who occasionally helps us filter through some of the rumors. The last few days we have had 4 sets of Tau rumors, and this email is in response to this one, and clarifying other rumors that are putting Firewarriors at BS4. the krootox giant has the following rules and stats - these I believe will change as we have had much discussions upon this unit and cannot be certain if it is powerful enough for a competitive environment. mental without control: If your krootox giant loses his krootox rider then the Giant must pass a leadership test every turn otherwise will attack the closest enemy unit. If the Giant cannot reach a target then it misses it next turn while it cools down. I've never seen those kroot giant rules before (currently named the Krootonne). There is a new large kroot model, but it's nothing like what's written, doesn't have a rider and doesn't have guns. Fire warriors can't be upgraded to bs4, the squad leader has an upgrade that raises their BS though for (currently) 50 points and goes away if he dies. I have like three versions of the rules, but I think some people are wish listing after getting hint of some stuff that's leaked. oooo this is exciting do you reckon they will have other kroot based units ? BS increase would be a massive step for fire warriors !! Yet More New Rumours, February 2013!